Two years ago my manuscript comprised 309K words. One month ago it was 150K. Five minutes ago I finally got it under 100K, the golden goal. Let me show you how. Feb. 16 is Presidents’ Day, when schoolchildren and federal employees get a day off. Since I am dependent on the latter for my research, that means it’s a day off for me, too. I will probably spend it doing some administrivia and maybe, if I’m lucky, a little writing. I fancy a walk out to see my favorite presidential memorial, but at the same time I don’t fancy having my face frozen off and it is wicked cold out there. Last week I hosted my own holiday on Lincoln’s birthday, which is well-nigh a sacred day if you grow up in Illinois. It seemed important to take special note of this year, since I am here in Washington and spending my days studying people who knew Lincoln and worked for him. So he already felt as close as a deceased president might; add to that my visiting of some significant relics. During lunch I popped up to the third floor to see the hat he wore on the night of his assassination; after the end of the workday I went to the museum that has two life masks and a very rare and special potrait, and rounded out the night by attending The Widow Lincoln at Ford’s Theatre. I’d never been there before, and it was an interesting play in part because, as the plot unfolds in the forty days following his death, he is absent from the stage, which makes the empty box more poignant, I think, than if I had just visited during normal touring hours. No one, I reckon, will ever say that the Manuscripts Reading Room of the Library of Congress is an inspiring place to work because of its physical environment. It is a bare-bones 1960s kind of functionalism but really, that’s OK. 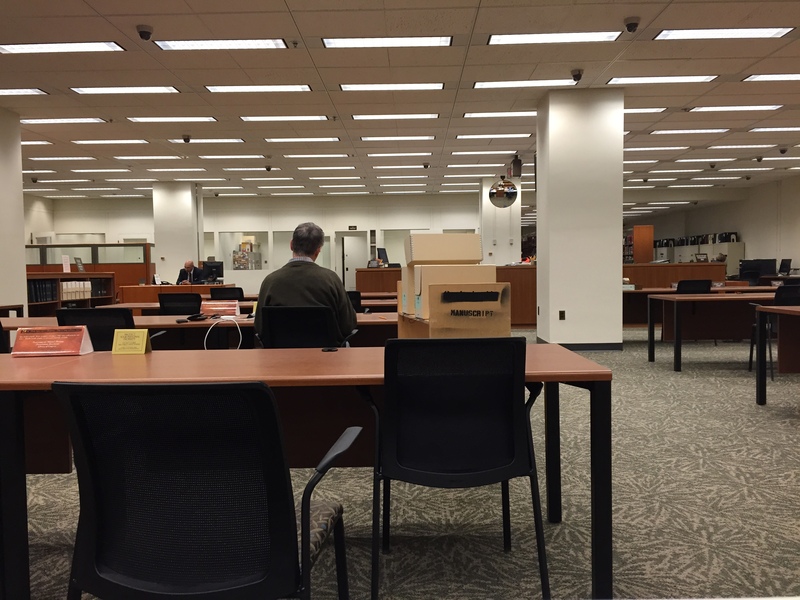 The big dome room in the Jefferson Building is pretty wowie-zowie, but here in Madison–described by one of my grad school profs as “the ugly one” to distinguish it from its two prettier Library of Congress siblings–it’s the papers that are the main event. (Although I should also add, the super-helpful, smart & nice crew of librarian/archivists are a wonderful ornament to this boring room.) I spent many days in January here, working on a little-known political operative named Benjamin Brown French. Even if he is not a big deal in the wider world, he is really special to me and my project. Handling forty years’ worth of his journals and letters was a real treat. One day I was flanked by people working on original documents of Walt Whitman and Booker T. Washington. That kind of moment will make even a well-seasoned archives diver take pause.